In 1846 the Barlow Road, the “last leg” of the overland Oregon Trail, was established offering the pioneers an alternative route around the south slope of Mt. Hood to Oregon City and the lush Willamette Valley rather than having to negotiate the treacherous Columbia River rapids. Philip Foster partnered with Sam Barlow in building the infamous road. At the time, Foster operated a store in Oregon City but investigated this Clackamas River valley, known as McSwain's Prairie, and determined it would be a perfect place to settle and build a new store. He established Foster’s Place in 1847 and gladly took advantage of the steady stream of settlers coming through on the newly established toll road, 19 miles before they would reach Oregon City. Here, after six months of travel, the emigrants would find their first glimpse of civilization—a general store, cabins to rent, a blacksmith, wagon camps, pastures for their herds, oats, wheat, and fresh fruit and vegetables. The Foster's also provided lodging and meals at their house. Many pioneer diaries attested to the joy at arriving at Foster’s (and grumbled at his prices). Got along fairly well and about four o'clock we came in sight of these houses and gardens, fields and fences! My heart arose in gratitude to God that we had been spared to reach this land! By 1880 Eagle Creek was a thriving community with an expanded store, dance hall, saloon, post office, drug store, schools, gristmill, and a nearby lumber mill. 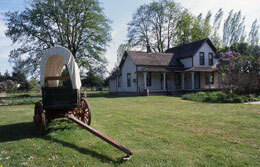 It is estimated some 10,000 emigrants passed through the Foster Farm from 1848 to 1915. With the dwindling of new arrivals, and a railroad and trolley system from Portland established, Eagle Creek soon was overshadowed in 1903 by the new resort town of Estacada. Today, the 1860s barn and 1883 house built by Foster’s son Egbert, are joined by a 1900s granary, replica store, blacksmith shop and log “rental” cabin built from Esther Belle Hannah’s 1852 diary descriptions.